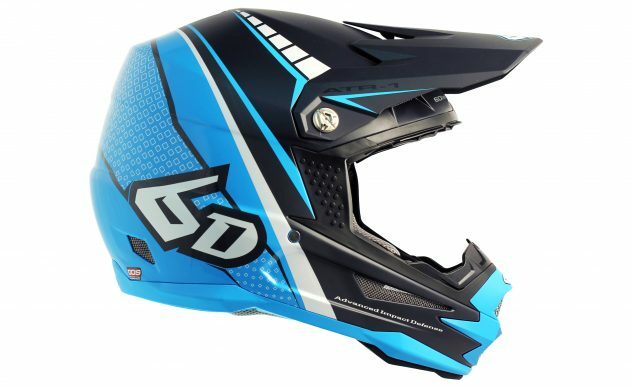 The 6D ATR-1 Edge off-road helmet offers omni-directional suspension technology designed to reduce the amount of impact energy transferred to the brain in an accident. According to 6D, the ATR-1 Edge is especially good at reducing low-threshold energy, a common cause of concussions from off-road accidents, and angular acceleration energy. The ATR-1 Edge has an intermediate oval shape and uses eight intake ports and five exhaust ports for cooling. 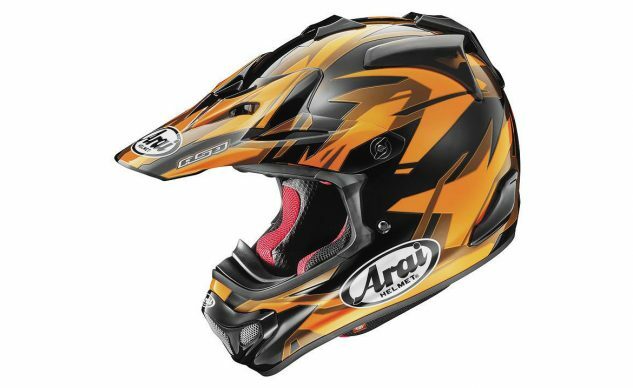 The VX Pro-4 Dazzle helmet replaces Arai’s popular VX Pro-3 off-road helmet. It features a round shell shape with a peak, mouth vent and top vents designed to break away on impact, reducing the chance of the helmet catching on anything. The helmet fits intermediate oval heads and offers a wide eyeport to accommodate large goggles. The Freccia 72 leather jacket is a tribute to Dainese’s racing heritage, with the racing suits of legendary riders printed on the liner. 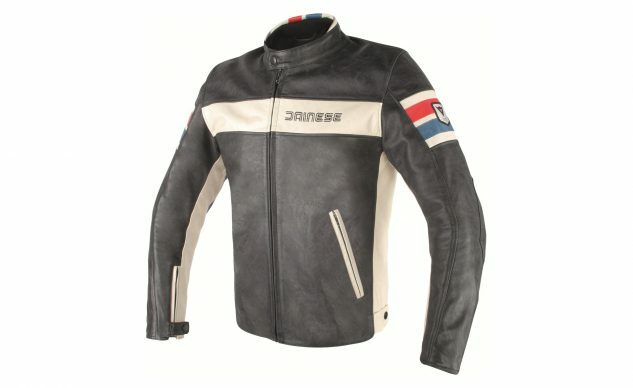 The bands and stripes on the sleeves also call back to Dainese’s racing tradition. 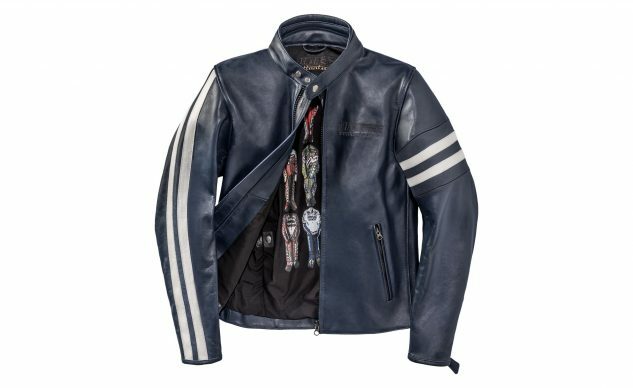 The jacket is made of natural cowhide leather with removable soft armor in the shoulders and elbows. The HF D1 perforated leather jacket is a modern replica of a classic Dainese jacket. The off-white panels, racing stripes and stencil-style logos and the aged finish on the full-grain leather provide a vintage touch. 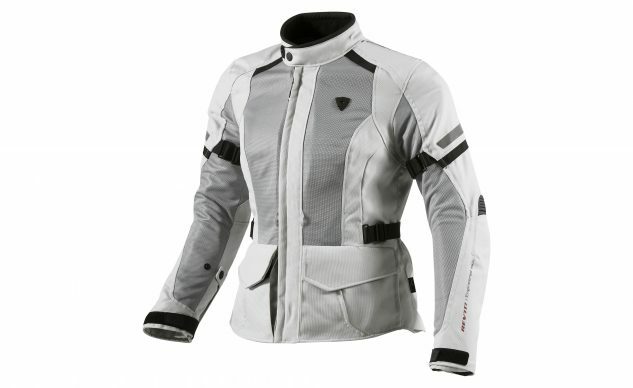 The jacket comes with removable soft protectors in the shoulders and elbows, and it can also be fitted with G1 or G2 back protectors (sold separately). The Rev’It Levante women’s jacket is suitable for a variety of weather conditions. The mesh outer shell keeps riders cool in warm temperatures, and when it gets really hot, the Levante can be fitted with Rev’It’s Challenger cooling vest. When the seasons turn, the detachable thermal liner keeps the wind and water out. 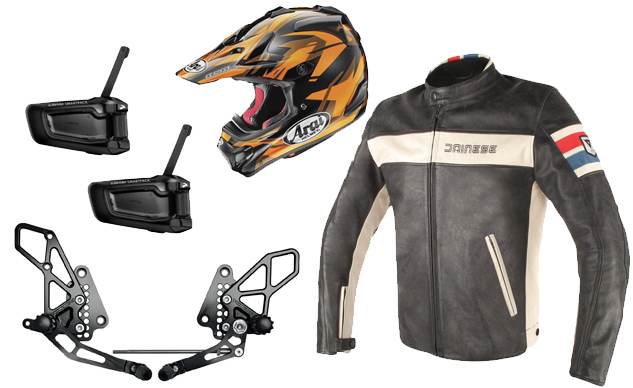 The jacket comes with CE protection in the shoulders and elbows and can fit various back protectors (sold separately). 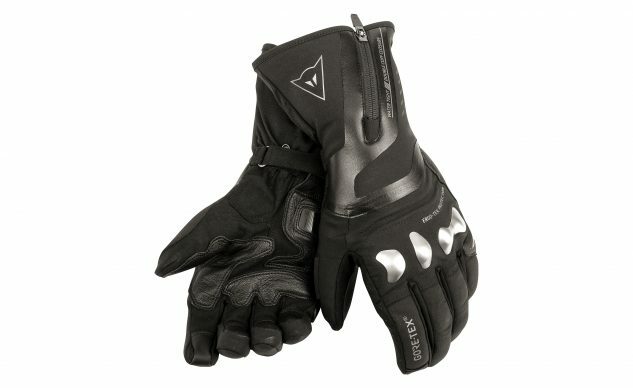 Dainese’s X-Travel Gore-Tex gloves are designed for three-season sport-touring riding. A Gore-Tex membrane keeps the gloves waterproof but breathable while thermal Dexfil padding keeps your hands well insulated. The Amica suede palm and the fingers are reinforced with goatskin leather for comfort. The long cuffs are double-layered, with an inner waterproof gaiter. Ergonomically-shaped stainless steel protectors cover the knuckles while inserts protect the finger joints. The pinkie fingers receive additional protection against slides while a polyurethane palm insert helps absorb landing impacts. The Dainese Bahia D-WP women’s boot offers a casual, classic style that looks like a regular boot when you’re not riding. 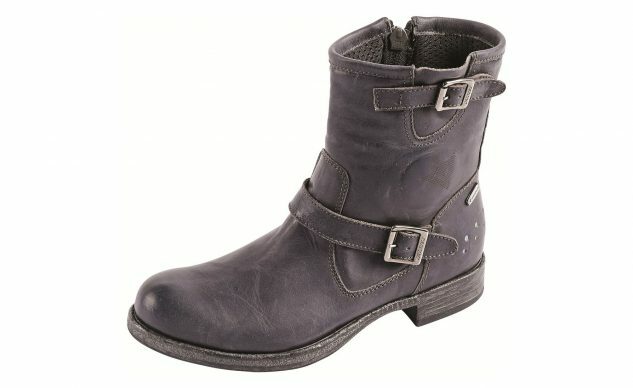 The boot is made from full-grain cowhide leather with two buckles for a vintage look. The CE-certified thermal molded sole offers grippy panels for the heel and the ball of the foot while offering enough flexibility to keep it comfortable for walking around. 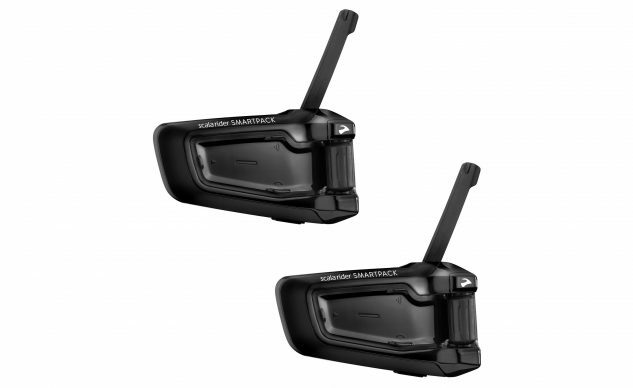 The Cardo Smart Pack comes with two Scala Rider communicators. Cardo’s Dynamic Meshwork Communication system keeps up to four riders in touch (a firmware update expands this to up to 15 riders) while Bluetooth connectivity make them compatible with headsets from other manufacturers. The headsets can also connect to GPS navigation devices, smartphones and music players and come with FM radio built in. Cardo claims 8-10 hours of listening time and up to 13 hours of talk-time. Vortex’s adjustable rearsets are available for a variety of motorcycles. 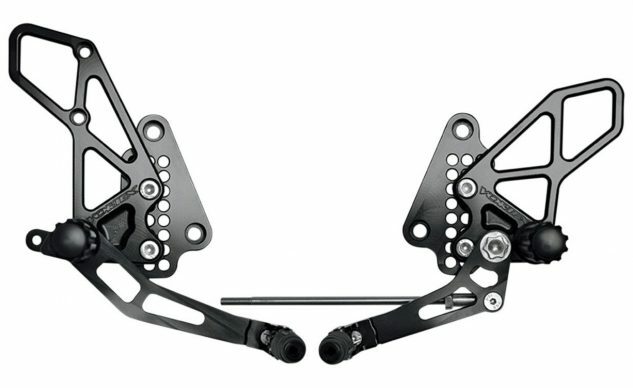 The rearsets are CNC_machined from 7075 T-6 aluminum and treated with a clear anodized finish. The attachment panels offer a wide range of adjustability and can be used with reverse shifting patterns. 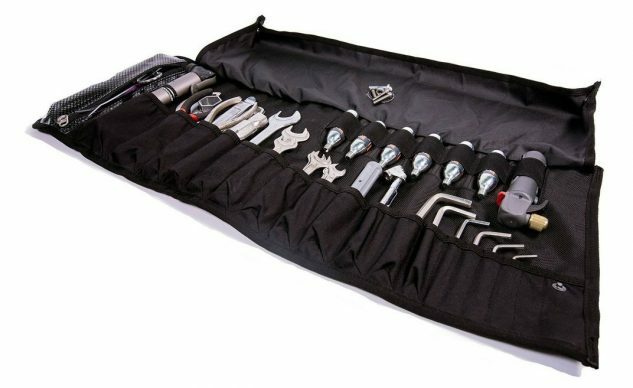 The Speedway Tool Roll from Velomacchi fits a variety of tools and can be easily rolled up for mobility. The main flap doubles as a work tray and has a built-in magnet to keep nuts and bolts in place. Adjustable aluminum hook closures and webbing straps keep everything nice and secure. Other features include a TPU laminated handle and YKK zippers. Tools are not included.